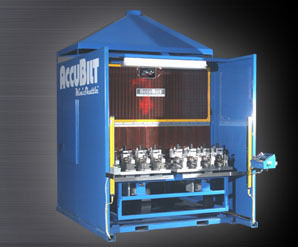 MiniShuttle Compact Weld Cell - AccuBilt, Inc. The patented Mini-Shuttle™ by AccuBilt offers a complete “ready-to-weld” shuttle MIG welding system with an incredibly small footprint. 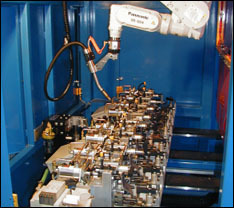 Utilizing a compact ceiling mounted 6-axis robot, the usable work envelope is maximized, while minimizing the cell footprint to only 7' x 10'. Each cell features two 24" x 34" tables mounted to pneumatically driven shuttles with a 500 lb capacity. The Mini-Shuttle™ is an economical solution that delivers unmatched productivity with ZERO index time*, making it more efficient than systems with turntables or indexers. 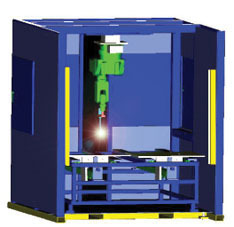 Fully assembled and wired, simply set in place with a forklift, connect	the input power, and begin welding. Easy plug & play setup!